The Hawaii underwater gallery showcases images I have captured during my snorkeling along the shores of Maui. I use a small underwater point and shoot and will capture whatever grabs my attention as worthy of posting in this gallery. 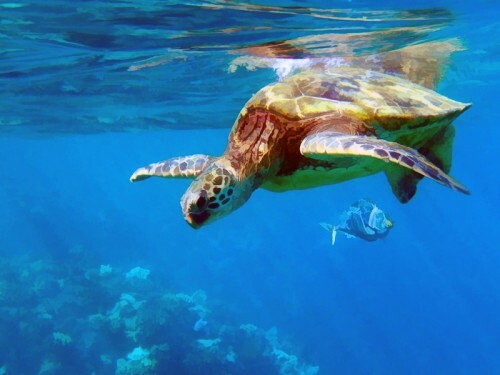 Most of the images are of Hawaiian Green Sea turtles, which are plentiful along the coastal waters of Maui. However, a variety of fish, from bright tangs to colorful parrotfish, are sometimes captured on digital files. There are some rare times when an octopus or an eel are visible. And, of course, the sea floor landscape can be stunning. All the images are post processed in Lightroom and Photoshop and many are also put through filters which give the image a painterly effect.